New research into average property values along the Tube network reveals homes hotspots and pockets of hidden value along the Victoria line. An article which criticised the rash of high rise blocks planned for erection near and along our part of the river appeared in Friday’s Evening Standard to add to others that are slowly rising to the surface. Hard to believe that it’s taken so long for the penny to drop. 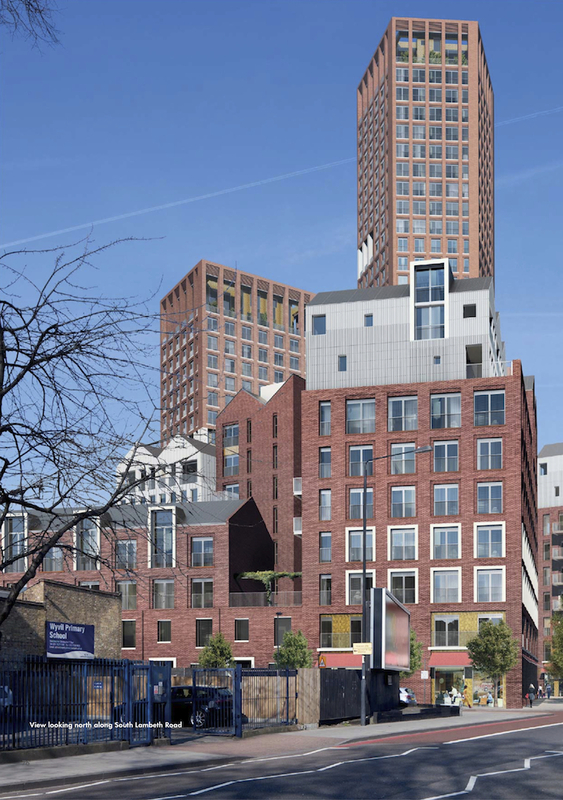 We’ve been highlighting ‘hideous‘ planned and actual Vauxhall developments on this blog for some time (and a few, rare, better thought-out ones) despite our short life, and despite comments appearing from defenders (aka employees) of these high-rise monstrosities. Anyway, it’s too late. Lambeth, Wandsworth, Boris, and Ken before him all thought it was a good way to fill their coffers. Shame on them for selling their our heritage and leaving the consequential mess for generations to come. There’s nothing wrong with regenerating our area, it’s to be welcomed, but a degree of central planning and co-ordination to ensure a cohesive overall result wouldn’t have been too much to expect, rather than the Klondike land-grab we’ve witnessed over the last five years. I pointed this out at a public meeting led by Labour Leader Lib Peck at the beginning of the year. I was treated as if I’d just farted passed wind in a lift. Chickens;home;roost. London is being “trashed” by a series of eyesore high-rise towers which are disfiguring its skyline, a planning expert has claimed. 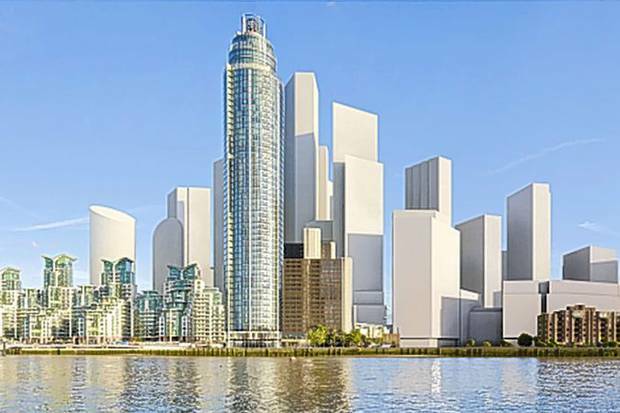 In the most significant intervention in the Skyline campaign to improve the design and planning of the capital’s tall buildings, former City of London planning officer Peter Rees warned of a “wave” of poorly designed residential towers built for maximum profit. Mr Rees, who spent 29 years shaping the City’s skyline, left the post this month to become professor of places and city planning at University College London’s Bartlett faculty. Rees claimed that planning authorities were “trapped” by ill-founded housing targets and a desperate need to secure payments to balance their budgets. He called on them to look instead to the best examples of high-density and mid-rise housing. Fashion designer Paul Smith, engineer Hanif Kara and architect Hugh Broughton are among those who have signed up to the Skyline campaign, which last week prompted a 950-word column in the Evening Standard by Mayor Boris Johnson, in which he acknowledged that 80 per cent of new tall buildings were residential, but defended the performance of the planning system. With vastly reducing budgets the Council cannot afford to play Policeman alone. By creating the rules in partnership with clubs, pubs AND local residents, the Council can focus on problem areas and premises much more effectively. This week saw the first in a series of problem solving discussions between pubs and clubs, local residents and various officers from licensing, trading standards, community safety and the police. I was there in my capacity as a local Councillor and we also had Public Health London and Vauxhall One, the business association for Vauxhall, round the table. Our aim is to jointly agree (or coproduce in today’s business speak) the ‘how should we implement and abide by our new licensing policy together’ so that no longer does it seem a cosy stitch up between the council and business to residents, or the Council and Councillors jumping to the tune of a few angry voters. As the Licensing authority the council needs to tread a fine line between regulation, responding to residents, and encouraging business growth and every instance is very different. Of course bringing together the experiences, expectations, gripes and aspirations of all concerned is no mean feat in a policy area which is almost always adversarial and polarised with seemingly sleep-deprived residents on one side and self confessed responsible businesses on the other. 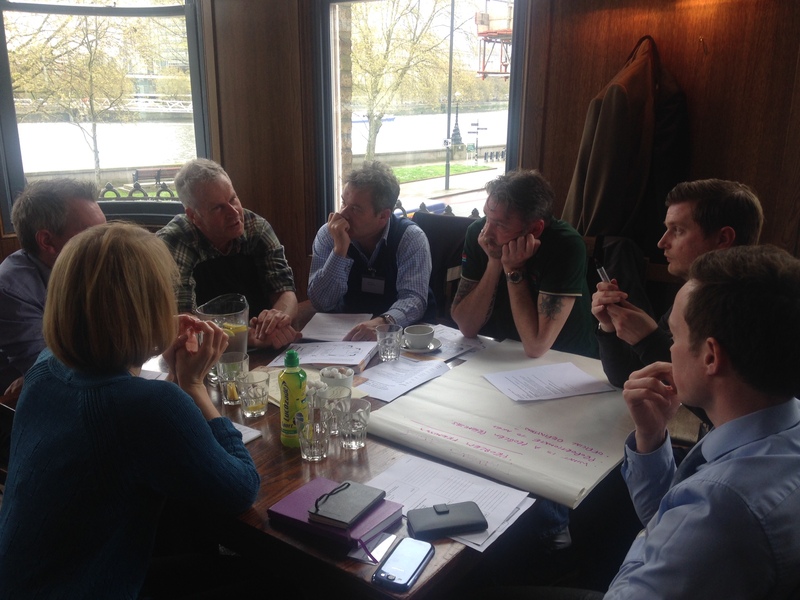 But that is what we started yesterday in Vauxhall at the Licensing Transformation Co-production workshop and will be doing in each of our major town centres over the next two months. Our guiding thought is that we must pave the way forward together and ensure that decision-making is transparent, with everyone having equal access to the rules, regulations and information. We have a new licensing policy which is stricter across the board in terms of getting a new licence, requiring businesses to demonstrate from the outset how they will operate responsibly and safely, and needing a demonstrable commitment and understanding of the neighbourhood; all that remains for us is to put this into practice. That is why we are also seeking views from our residents, businesses and partners on the council’s Licensing service and access to Licensing information, including how the outcomes of Committee decisions are communicated. We discussed the importance of having a named council officer for an area to report to and clarity for residents about who to report things to – not being passed from pillar to post between noise, licensing, the police or community safety. Residents wanted to be clear what constituted evidence and what support they could be given in getting it, not just from the council but within their local communities, to safeguard their area and prevent any potential problems. There was a clear distinction between large and smaller venues, and an acceptance by all that early engagement and dialogue was to be welcomed: sharing information meant for better outcomes. The best platform for this will be explored further for each area. 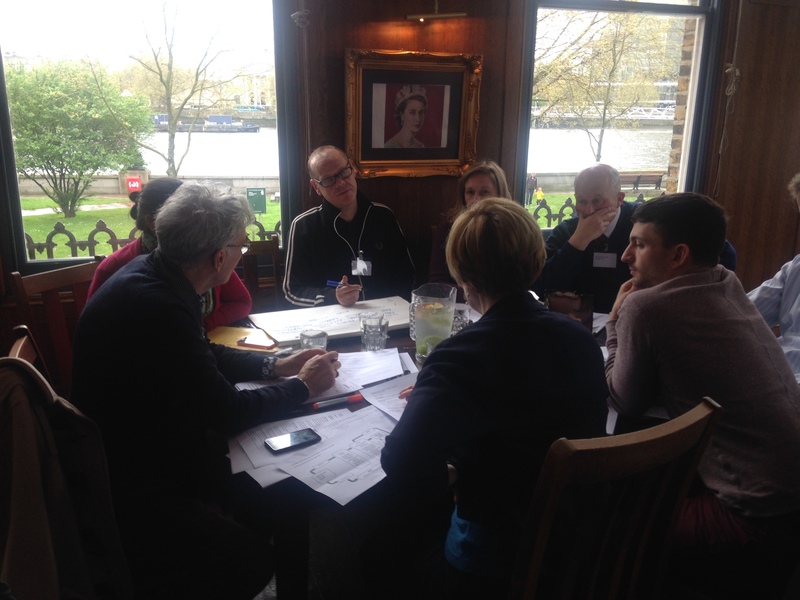 The role of our business improvement district, Vauxhall One, was questioned in resolving issues potentially caused by their members. They clearly they have a difficult position to defend their fee payers as well as reform practices and resolve issues. Welcome to my world! But most important was the conversation and the common understanding which was being developed and will continue to be developed. Policy is not made overnight, nor does it change things immediately it is agreed. Nor should it remain static when the world is anything but. It is the implementation of this policy, and the consideration of seasons, trends, our responsibilities to our residents, the regeneration over time of a neighbourhood, the changing make up of an area and of course market forces which needs us to lead and facilitate a strong, flexible dialogue which is ongoing. It’s dynamism comes from having real partners at the table and is its strength. I look forward to hearing the outcomes from the workshops about to happen in our other town centres and the follow up wider public discussion and input into how alcohol and our neighbourhoods work together. I suspect that areas in Lambeth with established and sometimes testing late night economies such as Clapham, Brixton, Vauxhall and the South Bank can look forward to discussions which are just as lively and productive as that which has taken place in Vauxhall, although the workshops in our town centres in Norwood and Streatham with their burgeoning nightlifes are likely to be just as vibrant and engaging. However challenging and diverse the views expressed it is essential that all parties get involved: that’s the point of our commitment to cooperative values and involvement of communities, both business and residential. Our job is to create the situation where cooperation and collaboration can take place, and act as arbiter in a fair way if cohesion is threatened. The most obvious way to get buy in is to let the players shape the rules. Then when they are broken no one can complain. We don’t have much, but previously it was a bit of an excuse for vegetation. 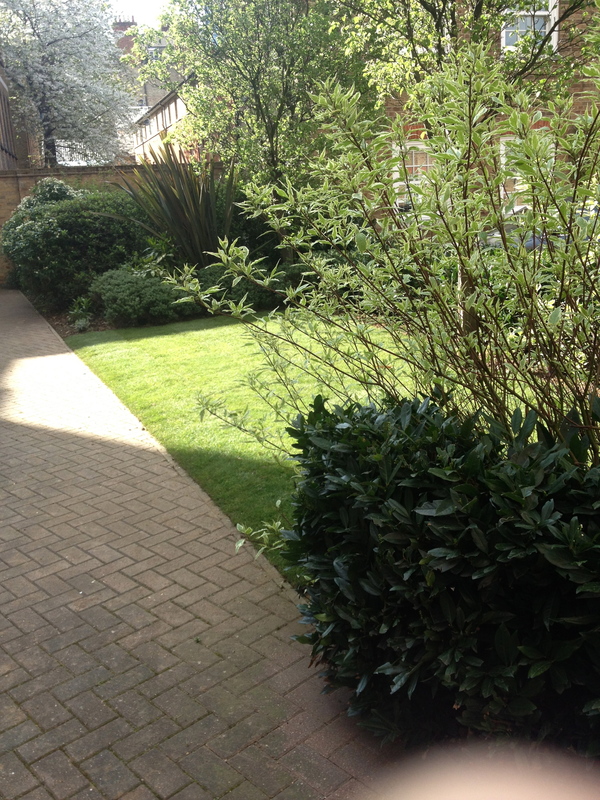 The recent appointment of new gardeners by our Managing Agents Lewis and Tucker (who really do listen to what we want) has resulted in a HUGE improvement in the surrounding greenery. 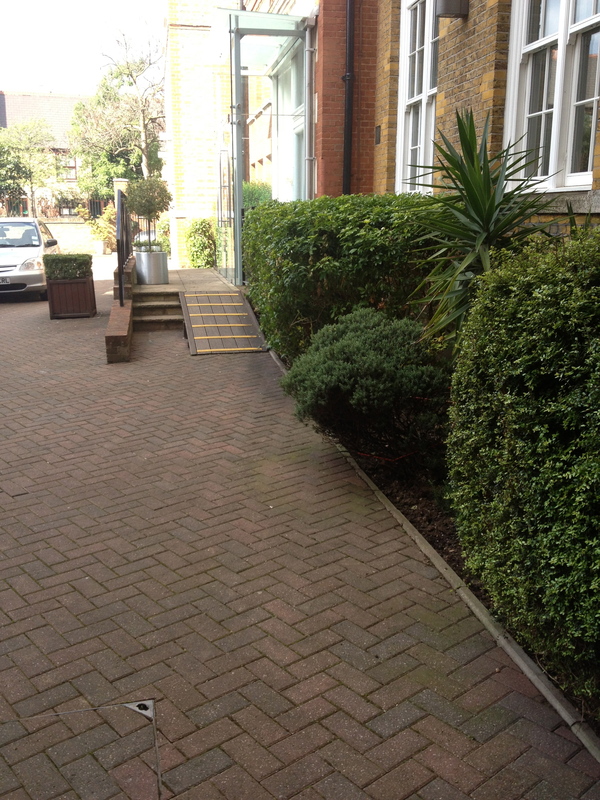 New turf has been laid in the Langley Lane section (in good time for our next BBQ on 3rd August, with the grills to be positioned EXACTLY where the sunbeams are shining in pic number two) and the shrubbery and potted plants are now looking terrific. Thanks chaps, we appreciate it. 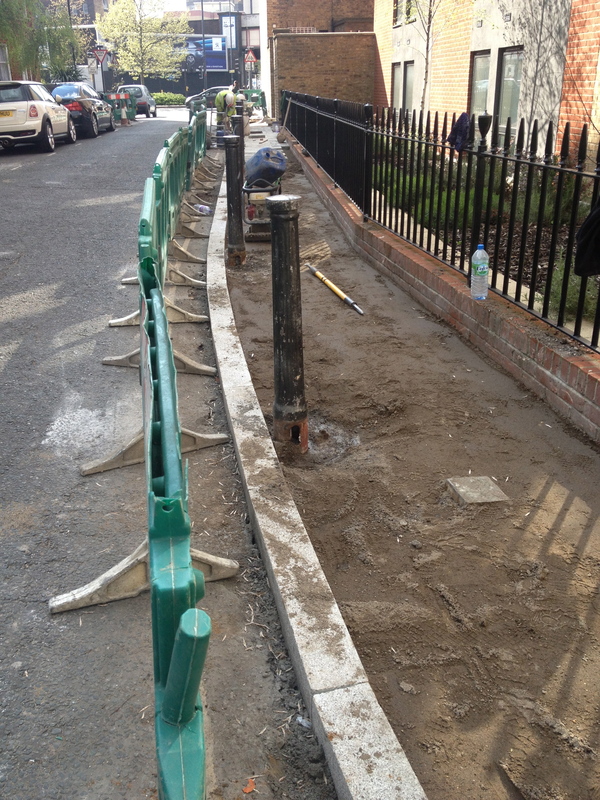 Well, it would appear that earlier reports of the disappearance of our Langley Lane bollards were, to quote the football press, somewhat ‘wide of the mark.’ They are in fact being reinstated, along with some very nice paving and a nice, stone, raised kerb. So please ignore my previous (and of course untypical) cynical remarks about having half a ton of tarmac dumped there. The double yellow lines will follow (or so says one of the chaps working on the paving), along with the parking fines. Clubbers beware. All of this has happened as a result of the Council being badgered by local residents. Which simply proves that we need to be constantly on the front foot in asking Lambeth to help us to improve our neighbourhood. If we don’t tell them then they’ll never know. 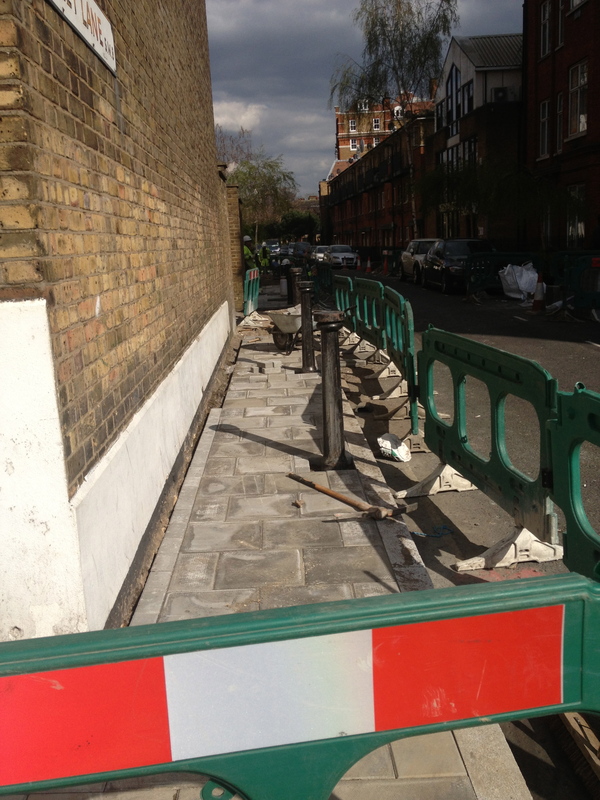 A big Thank You to Lambeth Council. It’s all happening in Langley Lane at the moment. 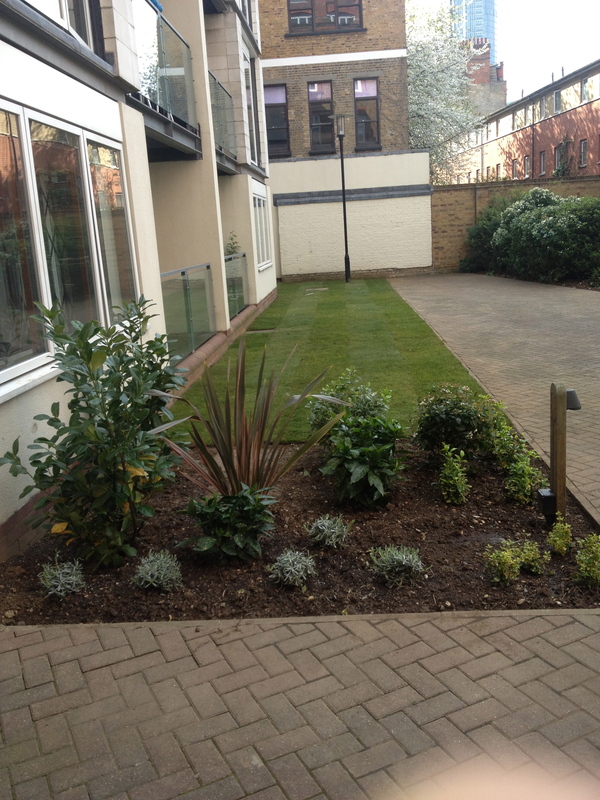 At one end, the Bonnington Square piazza is nearly finished. 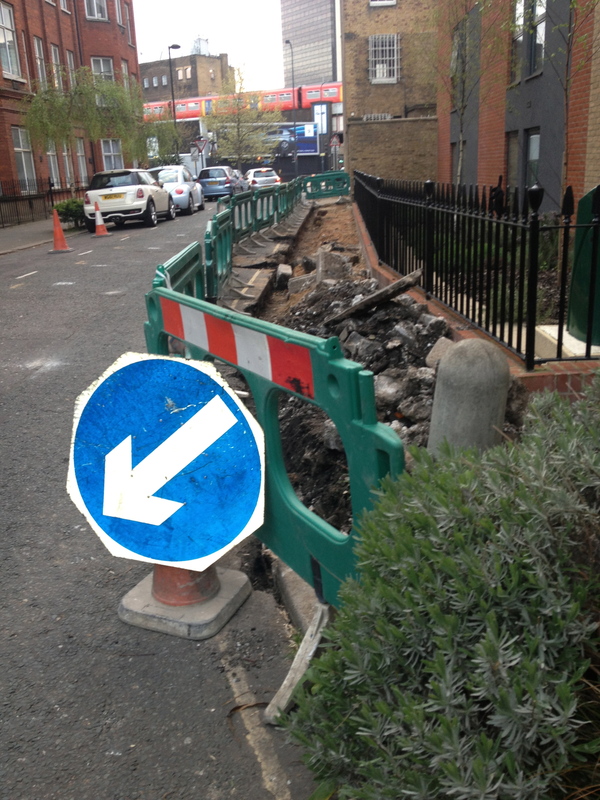 At the other, next to South Lambeth Road, the wrecked pavement (wrecked by developers that is) has been torn up, along with the bollards which our ever watchful council (i.e it noticed when we asked them to pay a visit) decided were too close to the road and didn’t give pedestrians enough room to pass. Well I know the incidences of obesity in the UK are increasing almost exponentially but I’ve never seen anyone have to shimmy or squeeze past the bollards on their way to the gyratory. No matter, they’re gone, and they are due to be replaced by a nice new pavement (we hope, but I wouldn’t be surprised to see a couple of tons of tarmac dumped there) together with double yellow lines. The council are adamant that it will enforce these yellow lines, which should mean that illegally parked clubbers who obstruct the exit from Langley Lane will soon be taking home substantial parking fines along with their hangovers, dodgy haircuts and bad fashion. As we said in a previous post, almost anything would be better than the eyesore currently blighting our landscape. I guess you could just about call the proposed design ‘almost anything.’ And it will probably cut off yet more sunlight from Vauxhall Park. Not to worry, it’ll be a great money spinner for BT’s property arm. And we all want that, don’t we? Hobsons Choice really.